Do you know what a Ralli Quilt is? I didn’t until I came across this wonderful website. A Ralli Quilt is a traditional quilt made by the women of Pakistan,and western India. The website asserts that the motifs and symbols used in these stunning quilts have been passed from mother to daughter and woman to woman for possibly thousands of years. There are three distinct styles – patchwork, embroidery and appliqué. The quilts are traditionally used not only as sleeping covers but also as floor coverings, storage bags and as padding for animals and workers. They can also form an important part of a girl’s dowry. The word “Ralli” is derived from local words meaning to mix or connect. If you visit the website do take a look at the items they have for sale. I especially like the pillows. Some of the motifs are very reminiscent of Hawaiian Appliqué. Also take a look at the Textiles page. These textile are just gorgeous. I’d love to be able to see them “in the flesh”. I don’t have any affiliation with the Ralli Quilts site, I just wanted to share. I hope you enjoy looking at them as much as I did. There is a book too, that is devoted to these lovely quilts called Ralli Quilts: Traditional Textiles from Pakistan and India written by Patricia Stoddard. I’m contemplating purchasing this one as I love traditional crafts. It’s available from their website and Amazon but I’ll probably get mine from the Book Depository [affiliate link]as the price is the same (AUD$32.54 – US$29.95) but there’s free worldwide postage. I’m still eagerly awaiting two books on Hawaiian Quilts that I ordered from them. Perhaps they got snowed in at Heathrow? I have 2 Ralli quilts, from Gujarat. Have had them for decades and the big one sits on the back of one of our settees and the other on the back of a chair, come to think of it, I have 3, I have a cushion cover too. I like the Gujarati ones as they have little mirrors (pallets) in them. As each grandchild has come along they find the mirrors and try to see themselves in them. I especially like the fact that I know I could never make one. The craft is treasured. Ralli quilts are wonderful traditional textiles of South Asia. 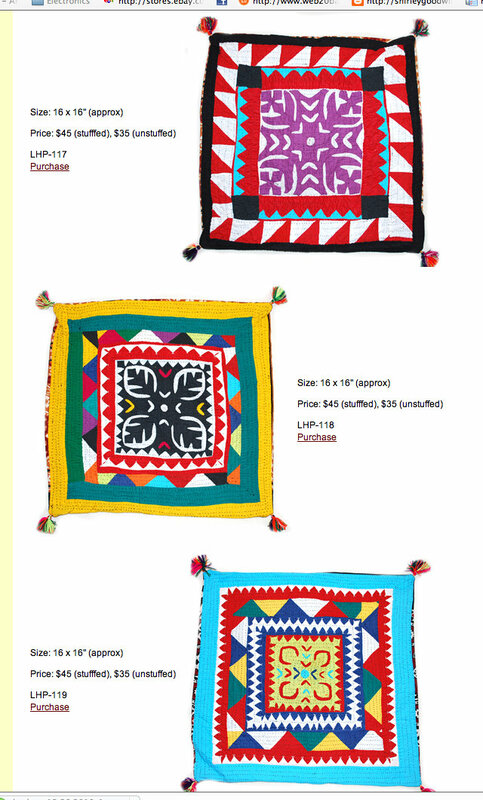 We represent a group of quilt artisans from desert Tharparkar, Pakistan. Our traditional handcrafted RALLI quilted products are shown in the International Folk Art Market Santa Fe, each year since 2004. Patricia Stoddard represents our (Lila Handicrafts) art there in Folk Art Market. I have read that great ever book on “RALLI QUILTS) written by Patricia Stoddard.